Know the expected NEET Cutoff 2018 for Government Medical College Seat as well as deemed university and private medical colleges. 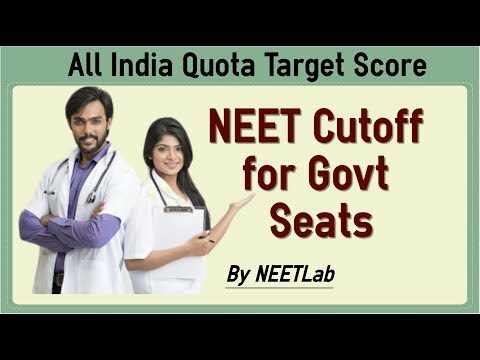 NEET cutoff given in this article for All India Quota for every reservation category is based on the NEET cutoff 2017. What is NEET Cut off 2018 – The (CBSE) Central Board of Secondary Education declares the Cut off marks for NEET 2018 during Jun. The cutoff means the minimum marks/score required by student to qualify in the exam. Candidates who qualify in NEET exam are eligible to seek admissions for MBBS and BDS in govt, management, Non Resident Indian (NRI) quota. In this article, we will focus on 15% All India Quota seats in Government Medical Colleges across India. After completing this article you will know what should be your All India Rank and NEET cutoff score to get into your dream medical college/nearby government medical college. Do you know that it is easy to get government college medical seat in less competitive states like Tamilnadu? One of the main reason why it is easy to get govt seat in Tamilnadu is because of the high number of medical colleges and government seats. A student who studied 10th and 12th from a state gets opportunity to get 85% state quota govt seats of that state. Click here if you want to know state quota NEET cutoff for Tamilnadu. There are more than 225 government colleges run by central and state governments with close to 31000 government medical seats where the fees is nominal as it is subsidised by the government. Apart from govt colleges, India has close to about 250 private medical colleges that provides close to 30000 MBBS seats. In this article, we will see only about the government colleges as seats for private medical colleges are not allocated through All India Quota Medical Counselling. There are four types of government colleges in India. All India Institute of Medical Sciences(AIIMS) and Jawaharlal Institute of Post graduate Medical Exam and Research(JIPMER) does not come under the NEET examination. They both conduct separate entrance exam for their institutions. There is also Armed Forces medical college at Pune which conducts separate counselling for admission based on the NEET score. All other government colleges run by both central government and state government come under the All India Medical Counselling. Fifteen percentage of the total government medical seats are allotted by the All India Medical Counselling. This comes to around 4600 seats. Rest of the government college seats are filled by the respective state government where the college is located. During 2017 NEET exam, nearly 12 lakh students appeared for the exam for the available 4650 All India Medical Quota Seats. Only one in 250 students has the chance to get medical seat. Now lets see the category wise reservations for All India Counselling. Unreserved(UR) or Open Community (OC) get the major chunk. Even though officially it is said that little more than 50% of the seats are for unreserved category. In reality, this comes to around 75% as last year only 80 Other Backward Class(OBC) reserved students got admission through All India Counselling. The reservation for scheduled cast(SC) category stands at 15% whereas for Scheduled Tribe (ST) it is 7.5. There is also reservation for physically handicapped across all categories which stands at 3%. Below NEET cutoff score range gives an overview of the NEET score for respective reservation categories. The data given here are released officially by the All India Medical Counselling Committee(MCC) for 2017. Based on the 2017 results, we can project the NEET cutoff 2018 depending on the difficulty level of the NEET 2018 Question Paper. Please visit this page after the NEET exam to know the Predictive NEET cutoff 2018 range for all categories. You are not seeing much difference between OC and OBC but for SC and ST the cutoff decreases by at-least 50 marks each from the NEET cutoff 2017 data given below. The top rank students seem to prefer Maulana Azad Medical College,Delhi and you can see the number of seats, All India Rank range and NEET score range for each reservation category. Maulana Azad Medical college NEET cutoff closing Rank during 2016 was 44. For 2015 AIMPT and 2014 AIMPT Cutoff Closing Rank was 28 and 59 respectively. The least preferred college among students in All India Counselling is Regional Medical College at Imphal. It got students with the lowest NEET cutoff 2017. The All India Rank Range and NEET score range for each reservation category is given below. From the top and least preferred college, we can come to a conclusion that if we target All India Rank below 2000 or NEET Score above 550, we can be 100% sure of government medical college seat. For example if Ravishankar from trichy who is born on 20/10/2001 wants to know the NEETscore range for Open category at Stanley Medical college madras he would send whatsapp request as shown here. Without Knowing Your Goal, there is no way you can aim for it. Whatsapp your dream college and we will send you the All India rank and expected NEET Score you should target to get into that college. During 2017 NEET examination, nearly 11 lakh students appeared in the exam and little more than 6 lakhs students qualified in the examination. In Open category/unreserved category the last NEET cutoff which is 50th percentile is 131 marks. For SC/St candidates, the NEET cutoff is 107 because their passing percentage is 40th percentile. How to find Cutoff for NEET 2018? Check You NEET 2018 OMR sheet and Answer key online after it gets published online by CBSE. You can Calculate your NEET Score by giving 4 marks for correct and -1 for incorrect answer. Match your score with the NEET cutoff of your dream college. 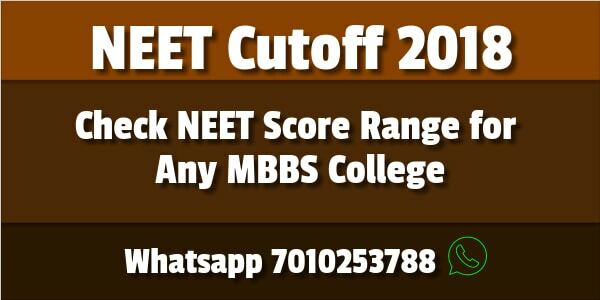 If you do not know the cutoff of your dream college, send us your dream college name along with other details such as your name, city, date of birth, category, NEET score, etc to Whatsapp number 7010253788 to get the cutoff based on NEET cutoff 2017 and difficulty level of the NEET 2018 question paper. Students appearing in NEET 2018 can get an overview by taking a look at the NEET cut off 2017 trends for famous colleges in different states. The NEET 2018 Results and merit list will be declared on June 5, 2018 by the NEET conducting authority, CBSE. The NEET 2018 score card will be released online to students to access. NEET 2018 registered students can login with their roll number and date of birth to access the NEET 2018 results. The NEET score card contains both All India Rank (AIR) as well as the NEET cutoff marks along with category-wise ranks. Please note that the score card will be available only for those students who qualified the NEET exam 2018 with minimum NEET cutoff of 2018. Based on this NEET 2018 merit list, all the state counselling authorities will release NEET merit list for students from their state based on their state’s education reservation policy. For All India Quota, NEET merit list for 2018 will be prepared by CBSE and counselling will be conducted by MCC to fill admissions for All India Quota seats. NEET 2018 counselling process will begin in the month of July 2018. All India Quota (AIQ) for the 15% seats will be conducted first by the MCC in 2 rounds and then each state would release its state merit list followed by counselling of NEET 2018 for 85% state quota seats. State Medical Council of every state is responsible for conducting NEET counselling 2018 for state quota seats. Counselling schedule for NEET 2018 will be released by MCC and respective state counselling committee. If you send us your Name, All India Rank, NEET score, State, College as Whatsapp request to 7010253788 as given below, we will figure out the probability of you getting medical seat in the requested college. It will help students to filling appropriate colleges as choices at the time of NEET 2018 counselling registration. NEET Cutoff marks 2018, NEET score 2018, Can I get college for this NEET score?, Which medical college I can get for this NEET score, NEET cutoff of government colleges, NEET cutoff 2018 for private colleges and deemed universities. The last cutoff who joined kumaramangalam medical college scored 384 for OC category through tamilnadu state quota. If you have any further queries, please send whatsapp request. I want to know whether 500 marks in neet 2018. Can i get in to all india quota in government college ? I am from tamilnadu but all the the while i studied i other states. 500 is not sufficient for all india quota.You will get good govt college in tamilnadu state quota if you have nativity certificate for tamilnadu. You have very good chance to get under Tamilnadu State quota. My marks are around 500 in neet 2018. Can I get a seat in mbbs with jharkhand Kota? You have very little chance. Jharkhand has only 3 govt colleges with 300 MBBS seats, so the competition is high as 20000 students are competing for this 300 seats. Respected sir,I am getting 463 marks in neet 2018 ,I am a native of Bihar and also have a domicile certificate of Delhi, can you please tell if would be able to get any bds seat in any govt. College? Delhi has 5 govt dental colleges whereas bihar has only one govt dental college. Seasons greetings…..sir I am getting 558 in neet 2018….will I get a govt medical college?I have Nativity certificate of Bihar…. You have good chance to get bihar state govt quota. For OC category, it would be really tough. My NEET 2018 score is 542 and my rank is 9180. I am from General category and haryana nativity. Are there any chances of me getting a seat in Christian Medical College, Vellore? And what are the chances of getting a govt. seat in haryana or in All India Quota Second Round? i scored 418 in neet 2018 . is there a chance of getting a mbbs seat in 85% karnataka quota . my air is 64537. Hello, my daughter born / studied up to her 6th grade in Tamil nadu. we as family had relocated to other parts of India between 2011 to April 2017, came back to Tamil nadu in April 17 and completing +2 standard CBSE this year 2019. We have community certificate (BC) issued long before by state government and also obtained now nativity certificate (Tamil nadu) based on her birth. She is appearing now NEET exam in May and planning to get admission with state quote in Tamil nadu. will there be any issues? If you have nativity certificate, then you wont have any issues applying under BC quota.